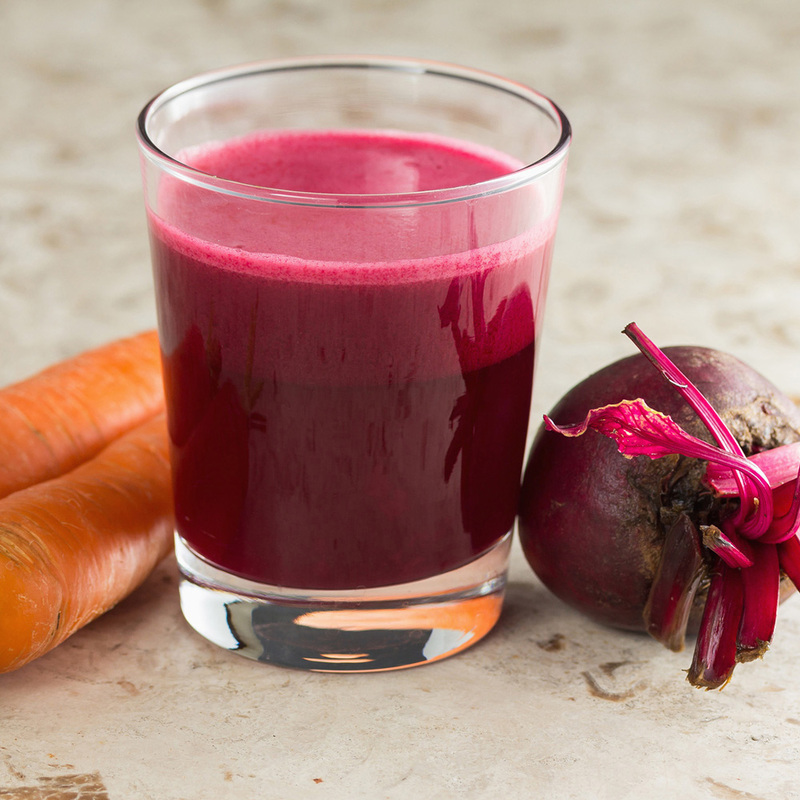 Beets and carrots and ginger, oh my! Give some love and care to your body with a healthy wellness juice. Juicing has many healing benefits, directly delivering superhero nutrients to your blood and organs. Bottoms up! Carrots are an excellent source of pro-vitamin A (beta-carotene and alpha-carotene) and Vitamin C. We need Vitamin A to promote healthy skin, immune systems, eye health, and vision. Additionally, Vitamin C offers antioxidant qualities while also helping produce collagen (a protein that plays a critical role in the structure of our bodies). Vitamin C also promotes serotonin which greatly impacts the nervous system, endocrine system, immune system, and digestive system. Increasing your Vitamin C intake is also an excellent way to heal a pesky cold! This super-food rocks! Ginger is a delicious root that contains a potent "spicy" flavor with fabulous health benefits. Ginger helps cleanse the body by improving digestion and circulation. Due to its detoxing abilities, ginger aids the body by cleansing toxins in the liver, colon, and other organs. To juice or not to juice? That is the question. Many people wonder whether juicing or blending is beneficial. Guess what? Both juicing and blending offer health benefits. For juicing, there is little digestion needed; therefore, juicing is a quick way for your organs and cells to receive nutrients. Juicing raw fruits and veggies is a fast and easy way to add nutrients to your body; however, it is important to juice responsibly. Beets, especially raw juiced beets, are powerful detoxifiers, so listen to how your body responds to beet juice and juice accordingly. Blending offers fiber, fiber, and more fiber which is super beneficial, especially for colon health! Dietary fiber found mainly in fruits, vegetables, whole grains and legumes, also helps maintain a healthy weight, balance blood sugar, and lower your risk of heart disease. You can enjoy both blending and juicing for fabulous health benefits. *Tart apples, such as Granny Smith, help balance sweet root vegetables, such as carrots and beets. Granny Smith apples are also powerful Gallbladder detoxifiers, perfect when creating a wellness juice. Enjoy! 1. Gently rinse all juicing ingredients, especially if juicing the peels. 2. Cut beets and apples in wedges. Cut carrots in half or juice whole. 4. Mix juice as it will settle. 5. Pour fresh juice over ice to chill.